The 64th Primetime Emmy Awards, honoring the best in prime time television programming from June 1, 2011 until May 31, 2012, were held on Sunday, September 23, 2012 at the Nokia Theatre in Downtown Los Angeles, California. ABC televised the ceremony in the United States. Comedian and late-night talk show host Jimmy Kimmel hosted the Primetime Emmys for the first time. Kimmel and Kerry Washington announced the nominations on July 19, 2012. Nick Offerman was originally scheduled to co-announce the nominations, but had to cancel due to travel delays. The Creative Arts Emmy Awards ceremony was held on September 15 and was televised on September 22, 2012 on ReelzChannel. The award for Outstanding Drama Series went to Showtime crime drama Homeland, the first for that network, and which broke Mad Men's four-year hold on the award; while the Outstanding Comedy Series award went for the third year in a row to ABC's Modern Family. This was the first ceremony that none of the four major American broadcasting TV networks were nominated in the categories of Outstanding Drama Series, Outstanding Lead Actor in a Drama Series, and Outstanding Supporting Actor in a Drama Series. 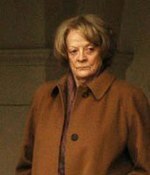 For Britain, the ceremony was noted for the successes of actors Damian Lewis of Homeland and Maggie Smith of Downton Abbey. Of the latter, Dame Smith not only was PBS' first win in her category, she had won the previous year, for the same role in another category. Hers was also the first win in a major acting category for a Drama Series for PBS since 1975. Mad Men set a new record for the largest "shutout" in Emmy history, receiving nominations for 17 awards and winning none. This broke the previous record of 16 nominations without a win, set by Northern Exposure in 1993. Before the recorded segment, Ron Howard presented a tribute to Andy Griffith. The ceremony, which was televised by ABC on September 23, 2012, was watched by 13.26 million viewers. The event's red carpet proceedings were watched by 5.63 million. ^ "Jimmy Kimmel joins Kerry Washington to Announce Emmy Nominations". emmys.com. Retrieved July 19, 2012. ^ "More Creative Arts Emmy Presenter Duos Announced". emmys.com. Retrieved September 15, 2012. ^ Stelter, Brian; Itzkoff, David (July 19, 2012). "Major Networks Shut Out of Best Drama Category in Emmy Nominations". The New York Times. Retrieved July 26, 2012. ^ "Lewis and Dame Maggie win Emmys". BBC. Retrieved 24 September 2012. ^ "Homeland's triumph is richly deserved". Guardian UK. 24 September 2012. Retrieved 27 September 2012. ^ "Homeland saves the day at Emmy Awards". LA Times. 24 September 2012. Retrieved 27 September 2012. ^ "Final Group of Primetime Emmys Presenters Includes Kathy Bates, Stephen Colbert, Jimmy Fallon and More". emmys.com. September 20, 2012. Retrieved September 20, 2012. ^ "10 New Presenters for 64th Primetime Emmys Include Andre Braugher, Julianna Margulies and Michael J. Fox". emmys.com. September 19, 2012. Retrieved September 19, 2012. ^ "Louis C.K., Ricky Gervais Among First Six Emmy Presenters Announced". emmys.com. September 11, 2012. Retrieved September 12, 2012. ^ Goldberg, Lesley (September 17, 2012). "Emmys 2012: Claire Danes, Emily Van Camp, Zooey Deschanel Among Latest Presenters". The Hollywood Reporter. Retrieved September 18, 2012. ^ Kondolojy, Amanda (September 25, 2012). "Sunday Final Ratings: Final Numbers for Emmy Awards, Sunday Night Football + Unscrambled CBS Numbers". TV by the Numbers. Retrieved September 25, 2012.